We are excited to announce that Pilates For Men is now offered every Tuesday at 12pm with Analia. 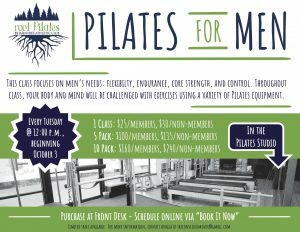 This class focuses on men’s needs: flexibility, endurance, core strength, and control. Throughout class, your body and mind will be challenged with exercises using a variety of Pilates equipment. Purchase at the front desk. Schedule online via BOOK IT NOW. Limited space available. For more information, contact Analia at theconsciousmover@gmail.com.